How to Create an Idyllic She-Shed for Your Backyard Retreat #infographic ~ Visualistan '+g+"
Do you have master plans for taking over your backyard? 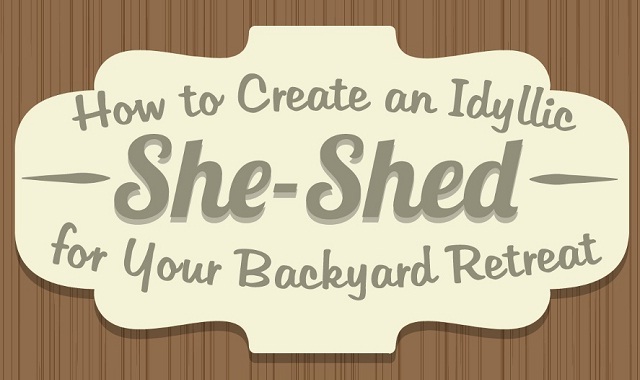 This guide to creating a she-shed will help you design your very own feminine backyard retreat. She-sheds are in vogue at the moment, with so many cute and gorgeous options to make your outdoor spot a bit more tranquil. Shove aside the power tools and bring in the hammocks! Make over a normal shed and build your own DIY she-shed with these tips. These are some of the current she-shed styles out there, so go with the fashion or create something just for you!